Closed out her collegiate career with her best season in the circle, earning NFCA First Team All-American honors as well as being named ACC Pitcher of the Year for the second year in a row…became just the third Seminole student-athlete in any sport to be drafted No. 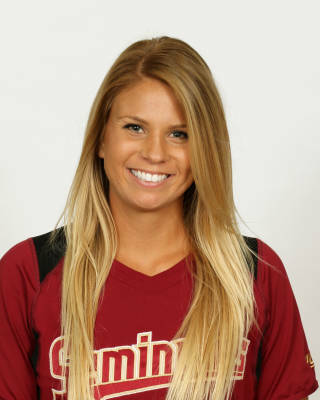 1 overall, as she was selected by the USSSA Pride in the 2017 National Pro Fastpitch draft, joining Paul Wilson (1994 – MLB) and Jameis Winston (2015 – NFL)…posted a 27-5 record, along with a 1.22 ERA as the Seminoles won their fourth consecutive ACC Championship and reached the NCAA Super Regionals for the fifth season in a row…tallied 195.0 innings pitched and gave up 109 hits, 42 runs, 34 earned, along with 31 walks and 266 strikeouts…limited opponents to a .158 batting average and tossed 11 complete games and seven shutouts…recorded four saves which tied an FSU single-season record, and her nine career saves also ties the FSU career record…received four ACC Player of the Week honors (Feb. 21, March 7, March 21 and March 28), along with one NFCA National Pitcher of the Week accolade on February 21…struck out the side to open the game in nine starts in 2017, and recorded three strikeouts in an inning 22 different times…earned the win on opening day against Lipscomb, tossing 4.0 innings and recording six strikeouts…gave up a lone run on a fourth-inning solo home run to Furman in a complete-game victory on Feb. 11…pitched the final inning against Florida A&M on Feb 15, allowing one hit and recording a strikeout…pitched 2.2 scoreless and hitless innings of relief with five strikeouts at the Seminoles came from behind to beat Northwestern on February 17…struck out the first six batters she faced against Northwestern on February 18, earning the win after giving up just one hit over 5.0 innings with nine strikeouts…posted eight strikeouts in 5.0 innings against Nebraska on Feb 19, allowing just one hit and one walk…struck out eight batters in 5.1 innings against Texas A&M…earned the win against San Diego State on Feb 24, giving up two runs on two hits with eight strikeouts in 5.2 innings…recorded her first save of the season, and sixth of her career, on Feb 25, recording the final out in a 1-0 win over No. 9 Arizona…posted five strikeouts and surrendered three hits in 4.2 innings in a win against No. 6 UCLA on February 26…tossed a complete-game one-hitter against Georgia Tech on March 3, allowing just three batters to reach base over 7.0 innings on a single and two walks as she tied a career high with 14 strikeouts…repeated her one-hit performance in a 5.0-inning complete-game victory on March 5 against GT, striking out six and allowing only one batter to reach base on an infield single in the fourth inning…struck out 11 and allowed three hits and zero walks in a 3-0 complete-game shutout victory over North Florida on March 8…posted eight strikeouts in just 3.0 innings as she earned the victory in relief at Virginia Tech (3/10)…recorded 12 strikeouts in a complete-game shutout against Florida Gulf Coast on March 14…gave up one run on two hits with nine strikeouts against Canisius on March 15…posted 10 strikeouts in 7.0 shutout innings versus Notre Dame, giving up four hits and two walks (one intentional)…did not allow a base hit until the fourth inning in three straight appearances – FGCU, Canisius and Notre Dame…struck out three batters in her 2.0 shutout innings at UCF on March 22…struck out the side in the first inning and totaled seven Ks without a walk in 4.0 innings at UVA (3/24)…tossed the fourth no-hitter of her career on March 26 at Virginia, allowing just two runners on a walk and a hit-by-pitch over 6.0 innings with 11 strikeouts…posted seven strikeouts in 5.0 innings without giving up an earned run against Pitt on March 31…tossed 4.2 shutout innings with nine strikeouts on April 2, allowing just two hits and a walk…combined to pitch 8.0 shutout innings to win both games of the doubleheader at Syracuse on April 9, recording 15 strikeouts and allowing four hits and zero walks…allowed just two hits over 6.1 shutout innings at No. 3 Florida on April 12, recording five strikeouts…struck out four in a 4.0-inning victory at Troy on April 18…threw a one-hitter at Louisville on April 23, striking out seven in the complete-game shutout…struck out nine batters on Senior Day, allowing two runs, one earned with two hits and two walks over 6.2 innings on April 30 versus UNC…took a perfect game into the sixth inning at No. 5 Oregon and recorded eight strikeouts for the game…allowed just one hit through 6.0 innings against Princeton in the opening game of the NCAA Tallahassee Regional on May 19, striking out eight without a walk…faced just one batter, but recorded two outs on a game-ending double play against No. 25 Georgia on May 21 to win the NCAA Tallahassee Regional. It marked her fourth save of the season and ninth of her career, tying the FSU record in both categories…tossed a complete-game three hitter against No. 18 LSU in game one of the NCAA Super Regional on May 26. Outstanding junior season, earning NFCA All-American honors for the first time in her career as she was selected to the Third Team…named ACC Pitcher of the Year and was named to the Women’s College World Series All-Tournament Team as she helped lead the Noles to the WCWS for the second time in the last three seasons…posted a 29-5 record with a 1.86 ERA and one save, including 14 complete games and six shutouts…recorded 235 strikeouts in 203.0 innings, limiting opponents to a .168 batting average for the season…gave up 122 hits, 64 runs, 54 earned, along with 60 walks…three-time ACC Pitcher of the Week (Feb. 29, March 7, March 21)…tossed a complete game victory at FIU on Feb. 12, allowing just one unearned run and one walk with eight strikeouts…struck out five batters without allowing a hit in a win versus Valparaiso (2/14)…earned the win against Stephen F. Austin (2/17) after retiring nine of the 10 batters she faced to start the game, including seven strikeouts…recorded eight strikeouts, including three against Sierra Romero, without allowing a walk in 5.0 innings against No. 2 Michigan on Feb 19…tossed a complete-game win with 10 strikeouts versus No. 20 Minnesota (Feb 20)…retired nine of the 10 batters she faced with six strikeouts in a 10-1 win against Florida A&M (2/24)…recorded her second career no-hitter in a five-inning victory against Bradley on Feb. 27…beat Hofstra while allowing one hit in a five inning victory on Feb. 26…did not allow a base hit until the seventh inning in a 3-0 road win at No. 13 UCLA (March 4)…pitched a complete game while only allowing one run on two hits in a 3-1 victory over Cal Poly…pitched a complete game against Syracuse and allowed two runs, striking out a season-high 11 batters…pitched a complete game shutout against Syracuse while striking out 10 batters on March 20…retired 21 of 22 batters faced in a 4-0 victory over Jacksonville on April 6 to give head coach Lonni Alameda her 500th career win…allowed only three hits in a career-high 10.1 innings, with nine strikeouts, in a loss at No. 1 Florida on April 13…pitched 10 innings while only allowing one run on three hits during the series against Virginia Tech (April 23-24)…pitched 2.0 innings with four strikeouts to record her first save of the season against UCF on April 27…recorded 10 strikeouts in 4.0 innings without giving up a hit against Florida A&M on May 5…tossed the third no-hitter of her career on May 20, striking out 14 Florida A&M batters (to tie a career high) in the opening round of the NCAA Regional…posted seven strikeouts in a win against No. 25 Utah in game one of the NCAA Super Regional on May 27…allowed four runs, one earned, on two hits over 2.0 innings of work against No. 15 Georgia at the Women’s College World Series on June 2…pitched 6.1 innings of shutout relief against No. 14 UCLA at the WCWS, allowing just two hits and zero walks with two strikeouts in FSU’s come-from-behind 8-4 victory over the Bruins on June 4…tossed a complete-game shutout of No. 2 Michigan at the WCWS on June 5, allowing just three hits and two walks with six strikeouts to send the Seminoles to the WCWS semifinals for the third time in school history…worked 3.0 innings of relief against No. 5 Auburn on June 5 at the WCWS, giving up two runs on three hits with zero walks or strikeouts. Completed an impressive sophomore campaign in the circle, securing ACC Tournament MVP honors along with All-ACC Second Team accolades…finished the season with a 19-6 record, 2.08 ERA with 219 strikeouts and 185.0 innings pitched…gave up 115 hits, 70 runs with 55 earned, along with 69 walks as teams batted .171 against her…made 39 appearances with 29 starts…recorded her first career no-hitter versus Coastal Carolina on March 8, posting seven strikeouts and one walk over 5.0 innings…faced just one over the minimum, retiring 18 of the 19 batters she faced, in a complete game victory over Georgia Southern on Feb. 7…recorded a career-high 14 strikeouts against No. 6 Kentucky on February 8…posted a complete-game victory over No. 20 Nebraska on February 13, allowing just four hits, one run, one walk and recording six strikeouts…set a career high with 10.0 innings pitched and earned the complete-game victory over South Carolina on Feb. 19…recorded nine strikeouts in a complete-game victory over Boston College on February 28…struck out 11 over 7.0 innings against Hofstra on March 7 as FSU came from behind to win 2-1…struck out the first seven batters of the game on March 17 against Colgate; finished with a complete-game 5.0 inning victory with 13 Ks and zero walks…recorded her second straight 13-strikeout performance on March 18 in a loss to Troy…registered nine strikeouts in a complete-game shutout of Pitt on March 28…tied a career high with 14 strikeouts in a 6.0-inning shutout of Florida A&M on April 1…earned her second career save at NC State on April 3, retiring all three batters she faced in the seventh inning as the Noles defeated the Wolfpack 6-5…posted her second save of the season on April 12, tossing the final 3.0 innings at Louisville without allowing a hit and striking out four in FSU’s 9-1 win…recorded 12 strikeouts in 5.0 innings as the Noles posted a 8-0, run-rule victory over UVa on April 18…retired all five batters she faced, including two strikeouts, in a relief appearance at No. 1 Florida on April 22…earned the win at Georgia Tech on April 26, tossing 4.0 innings and allowing one run on two hits with three strikeouts…struck out four batters in 2.0 shutout innings at North Florida on May 3…earned a save and recorded two wins in three relief appearances at the ACC Championships as she tossed 13.2 innings and posted 18 strikeouts while allowing just one run…allowed five hits and went 2-0 over three games and 16.1 innings of the NCAA Tallahassee Regional, including 16 strikeouts…allowed one unearned run over 6.0 innings in a 6-1 win at No. 8 Tennessee on May 22 as the Noles forced game three of the NCAA Knoxville Super Regional. Made a huge impact on the FSU pitching staff in her first full season in the circle…earned All-ACC Second Team honors…posted a 17-1 record and a 2.08 ERA with 125 strikeouts in 28 appearances with 21 starts…allowed opponents to hit .198 against her over 114.2 innings…had 14 appearances where she allowed two or fewer hits…tossed five complete games with three shutouts…was a top 25 finalist for NFCA National Freshman of the Year…named FSU Rookie of the Year by her teammates and coaches…allowed just one hit and zero runs with four strikeouts over 4.0 innings to get the win in her first career appearance at New Mexico State on Feb. 7…recorded nine strikeouts and allowed zero walks in a complete-game win over Southern Miss on Feb. 14…allowed just one hit over 5.0 innings in a shutout victory at Virginia (3/8)…retired 19 in a row while striking out a career-high 10 batters in a complete game victory over NC State on March 16…matched her career mark in strikeouts with 10 against Boston College (March 22) and Syracuse (April 19)…made the first relief appearance of her career against Florida on April 9, recording the final out of the game on a strikeout…allowed just two hits and posted eight strikeouts in a complete-game shutout of Georgia Tech (4/26)…earned her first career save by pitching a scoreless seventh inning against Georgia Tech on April 27…tossed 5.0 innings of relief and struck out four to earn the win against Georgia Tech in the ACC Quarterfinals on May 8…recorded four strikeouts and allowed just two hits in 3.0 innings of relief against Baylor at the Women’s College World Series. Redshirted her first year at Florida State…has the potential to make a great impact on the pitching staff in 2014…earned the Seminole Warrior Award for her maximum effort put forth in the weight room…should form an effective tandem with All-American pitcher Lacey Waldrop in the 2014 season…despite not gaining time on the field, she threw excellent bullpen sessions and has a strong repertoire of pitches. Had plenty of success at Houston County High…varsity letterwinner all four years and played club ball for nine years with the Atlanta Vipers…accolades include first team all-county and all-region as well as second team all-state as a freshman…named first team all-state, all-county, and all-region as a sophomore…region pitcher of the year runner-up following sophomore campaign…first team all-county and all-region as a junior…also a second team all-state player as a junior…first team all-state, all-region and all-county following senior season…earned county player of the year honors…tossed several no-hitters in high school. Born on Nov. 22, 1993…majoring in Social Science…daughter of Alesia Taylor and Joe Burroughs…has one sister…favorite movie is “Pearl Harbor”…wears the No. 16 because her life seems to be lucky when that number is around…enjoys participating in community service with the team, especially visiting patients at Tallahassee Memorial Hospital…favorite song is Rhiannon by Fleetwood Mac…favorite subject in school is math…favorite home-cooked meal is twice baked potatoes and shrimp scampi…says that the best part of being an ACC student-athlete is being a part of a softball program that will make ACC history…her sport idol as a child was Jennie Finch…most unique job in high school was painting the softball dugout…had numerous pets growing up – two ducks, four dogs, two hamsters, two guinea pigs and two cats…aspires to own her own restaurant…television show she watches the most is “Pretty Little Liars”…favorite accessory in her wardrobe are her Olukai flip flops…loves shopping.